OpenStreetMap is a collaborative project to create maps (http://openstreetmap.org) which offers a nice API to access and download map tiles. Onil Goubier (onil.goubier@gmail.com), Thierry Goubier (thierry.goubier@cea.fr), and Sergio Maass (sergio.maass@gmail.com) have contributed to integration of OpenStreetMap in Roassal. These contributions are under the MIT License. Figure 0.1 is obtained by simply creating an element from the shape RTOSM and adding it to a view. 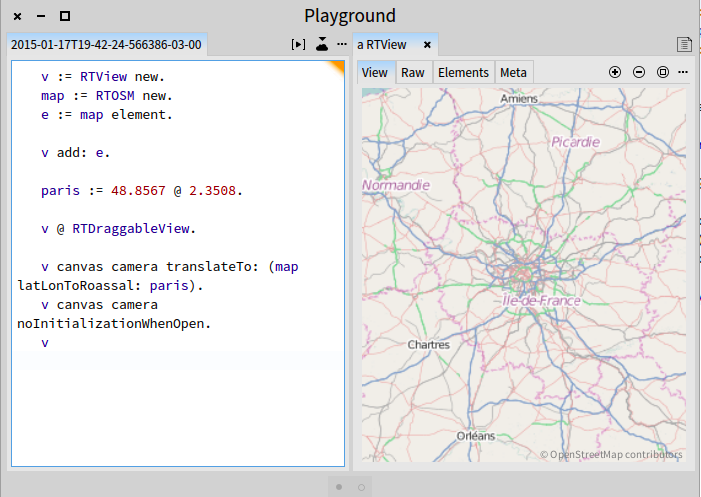 The map can be scrolled (thanks to v @ RTDraggableView). The Pharo inspector offers zooming in and out. When visualizing OpenStreet map tiles, you may want to disable the automatic camera positioning. This is achieved with RTEmptyViewContext setOnView: v.
paris := 48.8567 @ 2.3508.
v canvas camera translateTo: (map latLonToRoassal: paris). The variable paris contains a point latitude @ longitude. This coordinate is easily obtained by googling for it or is available from Wikipedia. mb menu: 'Paris' callback: [ movingCamera value: 48.8567 @ 2.3508 ]. mb menu: 'London' callback: [ movingCamera value: 51.50722 @ -0.12750 ]. mb menu: 'NewYork' callback: [ movingCamera value: 40.7127 @ -74.0059 ]. The script above defines the block called movingCamera which takes as argument a geographical location. The blocks move the camera accordingly and signal a refresh. A menu is then defined to let the user click on each city name to move the camera. csv := (ZnEasy get: 'http://earthquake.usgs.gov/earthquakes/feed/v1.0/summary/2.5_month.csv') contents. tab replaceEmptyValuesWith: '0' inColumns: #(2 3 5). tab convertColumnsAsFloat: #(2 3 5). color: (Color red alpha: 0.3)) elementOn: row fifth. e @ RTPopup @ RTHighlightable. e translateTo: (map latLonToRoassal: row second @ row third). v canvas camera scale: 0.02; noInitializationWhenOpen. The script begins by fetching data from the Earthquake Hazards Program server. The fetched CSV file has to be slightly processed to replace double commas (,,) entries by a zero (,0,) and to convert some columns into float numbers. Column 2 of the file corresponds to the latitude of the event; Column 3 to the longitude; Column 5 to the seism intensity. For each table row an ellipse is created with an exponential size. Each produced element has a popup and is highlightable. The ellipse is then translated to its calculated position in the Roassal space. A scale of 0.02 is used to give an overview of the map. Thanks to the noInitializationWhenOpen setting the map keeps the 0.02 scale value when opened. Without this setting, the value of 1 is used. The view is made draggable. Some data are frequently given for a particular country. 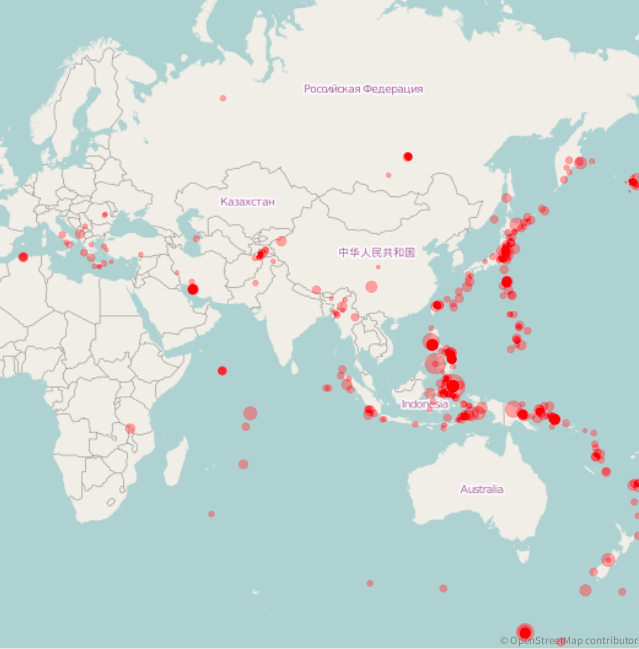 Visualizing data-related country involves a translation from the country name to the geographical location. 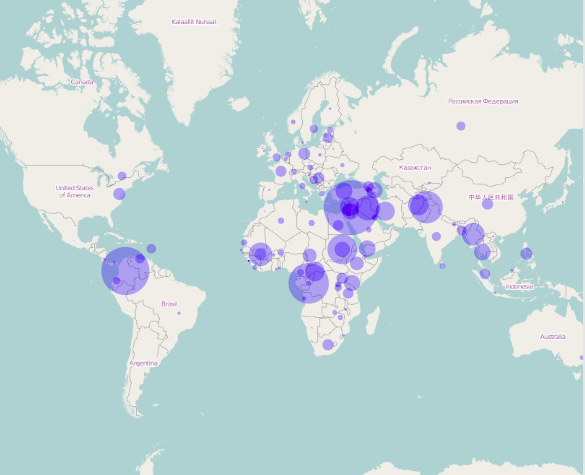 Consider the data offered by the United Nations High Commissioner for Refugees (UNHCR, http://popstats.unhcr.org). d := (countries detect: [ :dd | (dd at: 'name') = 'Afghanistan' ]) at: 'latlng'. tab := RTTabTable new input: RTOSM peopleForUNHCR usingDelimiter: $,. 4 timesRepeat: [ tab removeFirstRow ]. ifFalse: [ value asNumber ] ]. "We are interested in countries that have at least one refugee and we wort the countries in reverse order according to the number of refugies they have. This is helpful in the case of element overlaping"
sorted: [ :a :b | a third > b third ]. "Trying to get the country corresponding to the row"
latLng := (theCountry at: 'latlng'). e translateTo: (map latLonToRoassal: lat @ lon). v add: e ] ]. v @ RTDraggableView @ RTZoomableView. The method peopleForUNHCR contains the data fetched from the UNHCR server.